Kingston Weekender's guide to casual dining in Kingston, NY. Find out where to casually eat, order in or order take out in Hudson Valley's Kingston, NY. For three-quarters of a century Dallas Hot Wieners has been serving up their legendary hot dogs. Try a taste of their famous secret sauce and you’ll understand why locals and tourists can’t get enough of this neighborhood landmark. The ultimate in quick dining and known for its delicious menu, quality food and affordable prices. Diego's Taqueria serves deliciously fresh and responsibly sourced street-style tacos in a spot you won't want to leave! The sweet corn on the cob was covered in a cheesey chili rub yumminess and we paired it with a couple soft tacos and a tasty bean salad. Voted "One of our best places to eat breakfast in 2014". One of the best crepes we ever had too. They're so popular the owner, Alessandra Tecchio keeps 14 delicious crepes constantly on her menu. Gluten free dishes available. Whether you are looking for a cappuccino, a great panini, or fresh pasta and meatballs, great food awaits just around the corner! Savory aromas. Home style cooking. A gathering place of friendly faces, laughter, and soft music where neighbors and new faces are welcomed like family. The freshest ingredients available. Local produce used when in season. The best coffee, hand made baked goods, breakfast and lunch found anywhere in the Hudson Valley. Come enjoy the panoramic views and unique cafe experience in beautiful, historic, Uptown Kingston, NY. Flashy flavors catch fire in your mouth as Beez delivers bombastic tasteful subs and wraps for breakfast and lunch. Featured below are the Bob Marley, Buster Douglas, Real Burger King and the Uncle Sam sandwhiches. Kovo is a Greek-inspired casual restaurant with a focus on rotisserie meats and fresh, seasonal salads. 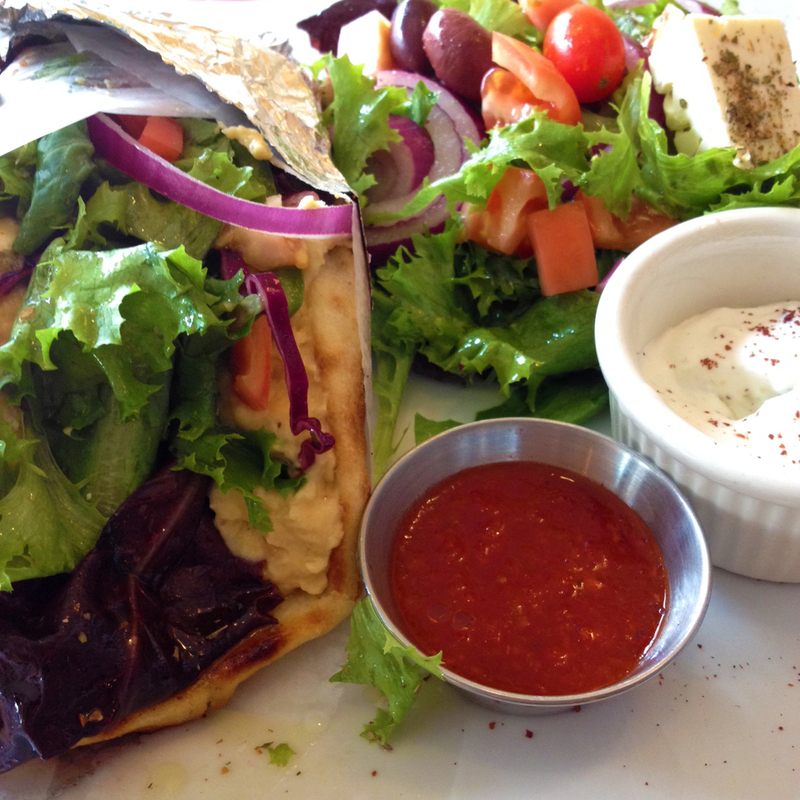 Their food combines the healthy ingredients inspired by the owner's Greek ancestry and from the Hudson Valley. Kovo's pledge is to serve the finest, freshest local produce and meat as possible. Come warm up this fall and winter with the best soups, stews and chili in town! Kingston's fastest place to grab breakfast and lunch. One of the easiest and best places to grab a sandwich or soup. Just walk up to the window and order! $4 small soup, $6 large soup. They have a variety of soups every day including vegetarian, meat, and gluten free soups. You'll see 5+ soups everyday including varieties like Hungarian goulash, Jalepeno corn chowder, Chicken and roasted vegetable, creamy cauliflower soup, and Sean's famous beef chili. Wall street has a new neighbor, Opa Gyros & Greek Grill. A casual little spot that has all your favorite Greek staples. They have a few tables inside as well as outdoors. We tried the falafal and the gryo pita sandwich ($5.75) and the Falafel pita sandwich ($5.95) they both hit the spot, mmmm mmm delicious! Located in Midtown Kingston, this is one of our favorite Brunch spots in the city. It's an eclectic southern join with food that's a little comfort, a little healthy and a lot of pure goodness. Sissy's Cafe, where you can get cleansing raw juices, filling smoothies, gigantic salads, hot cheesy panini or a classic deli sandwich. They will try to cater to most dietary needs including vegan, vegetarian, gluten-free, organic and good old fashion meat eaters. With fresh ingredients and local produce, the menu will be a constant flow of new ideas and creative classics. "An Asian-inspired noodle bar that offers extraordinary cuisine made with local, farm-fresh ingredients at affordable prices in a hip setting. Under their formula, diners can mix and match their noodles (from ramen to the thin, Japanese soba), broth (vegetarian to curry-coconut) and protein (chicken to salmon). Portions are served in huge bowls for $10. Adventurous diners can pick a unique plate off the menu like Vietnamese beef salad or tofu and eggplant curry or even the popular raw kale salad. The only pizza joint in Uptown Kingston- so if you're craving a pizza this is your place. Super friendly atmosphere and staff. Family-run with a nice dining and cooking area. No delivery, pickup or dine in only.